Comments: On June 17, 1914, Scottsville Masonic Lodge #45 laid the cornerstone for its current home at 137 Main Street. It was a stirring day in Scottsville with the town band marching down Valley Street, leading Lodge members from their meeting area at Beal's Hall to the new Lodge site. The first Lodge meeting was held in the upstairs meeting area after the building was completed in 1915 at a cost of $6000. 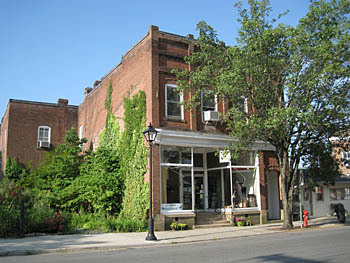 The United States Government rented the building's first floor to serve as the Scottsville Post Office from 1915 until the post office moved in 1964 to a new location on West Main Street. In 2010, Coleman's Outdoors store occupied the old Post Office's first floor. Masonic Lodge #45 began its history in Scottsville on December 7, 1851 and received its charter at their Valley Street meeting hall on the second floor of the Beal Building. James W. Mason opened and closed the charter night exercises as the first Worshipful Master. Members present for this historic meeting were William B. Brady, Sr.; John Hickok, Jr.; James Brady; Silas W. Dawson; Charles E. Little; J.L. Brady; J. M. Wade; W. F. Crawford; James A. Forbes; J.B. Dodd; W. Donoho; and James A. Leitch. On December 7, 1951, the Scottsville Masons celebrated their 100th anniversary with a public ceremony in front of the Scottsville Masonic Lodge. Following the public program, a social hour was held in the Banquet Room of the Lodge for the members and visiting masons. At 6:30 pm, a banquet was held in the Auditorium of the Scottsville High School which was also ladies night; the guest speaker was Past Grand Master of Masons in Virginia and then the current Grand Secretary of the Grand Lodge of Virginia. The Scottsville centennial committee in charge of the arrangements for their 100th anniversary celebration was composed of Rt. Wor. A.R. Thacker chairman Wor. W. A. and Ellis P. Jones. The History Committee was composed of Rt. Wor. F.P. Scott; Chairman Rt. Wor. J.H. Duncan; Wor. C.A. Whitted, John P. Dorrier, and T.H. Gillis. In honor of this Masonic anniversary, the History Committee authored a history of the lodge which was printed for distribution on December 7 and found records complete through the Civil War years. On the roster of members of Scottsville No. 45 were Peyton S. Coles, Grand Master of the Grand Lodge of Virginia in 1879 and 1880. There were also three Past District Deputy Grand Masters of the 17th Masonic District who were members of Lodge 45: J.H. Duncan, A.R. Thacker, and F. Pierson Sott. In 1951 the officers of Lodge 45 were E.B. McCormick, Wor. Master; L. E. Baber, Senior Warden; Larkin Londeree, Junior Warden; J.W. Boggs, Senior Deacon; T.H. Gillis, Junior Deacon; T.A. Allison, Chaplain; C.R. Dorrier, Treasurer; C.A. Whitted Secretary; A.L. Thacker, Tiler; and J.E. Daniel, Chaplain emeritus. B. Scottsville Sun, Thursday, November 29, 1951, p. 1. Courtesy of Scottsville Museum, Scottsville, VA.